The aim of this study is to investigate the clinical role of 18F-fluorodeoxyglucose (18F-FDG) positron emission tomography/computed tomography (PET/CT) in patients with carcinoma of unknown primary (CUP). One hundred twenty one patients with a diagnosis of CUP who underwent whole body 18F-FDG PET/CT imaging were included in this retrospective study. The final diagnoses were confirmed either histopathologically or by clinical follow-up. The 18F-FDG-PET/CT successfully detected the primary tumor in 59 out of 121 (49%) patients. The most common primary tumor as detected by 18F-FDG PET/CT was lung cancer (n=31). In a patient, two primary tumors (colon and prostate) were detected on PET/CT imaging. Bone marrow biopsy revealed prostate cancer in this patient and the colon cancer was accepted as a synchronous second primary tumor. 18F-FDG PET/CT findings were false-positive in 11 patients. 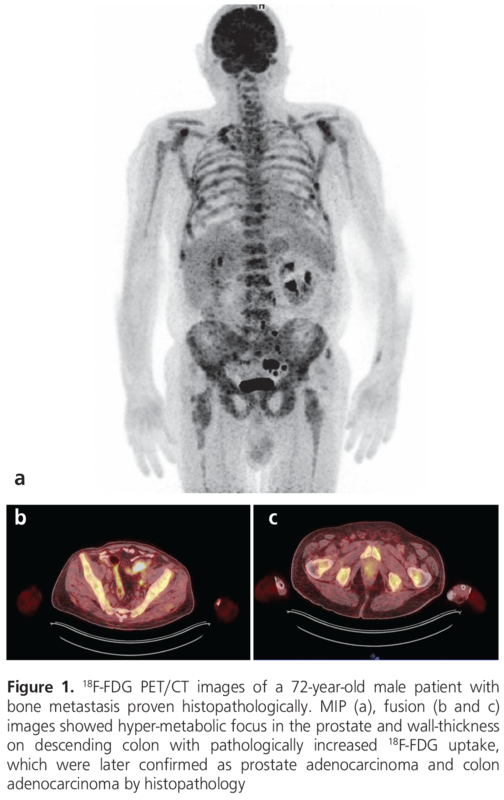 18F-FDG PET/CT could not detect any primary lesion in 51 patients, whose conventional work-up detected a primary tumor in 11 and thus considered as false-negative. The sensitivity, specificity rate and accuracy of 18F-FDG PET/CT in detection of primary tumor were identified as 84%, 78% and 82%, respectively. Whole body 18F-FDG PET/CT is an effective method for detecting the primary tumor in patients with CUP. In addition to detecting the primary tumor, it can also help determine disease extent and contribute to patient management. Carcinoma of unknown primary (CUP) refers to the presence of metastatic disease for which the site of the primary lesion remains unidentified after conventional diagnostic procedures. CUP accounts for approximately 2.3-4.2% of cancer in both men and women (1,2). The mean survival is between 3-11 months, and only 25% of patients survive over one year (3,4). Several studies have shown that survival of patients in whom the primary tumor has been detected was higher than that of patients in whom the primary tumor has remained unknown (5,6). Various radiologic methods and serum tumor markers can be used for primary tumor detection. However, the primary tumor could be detected in less than 20% of patients with CUP (1). Although spontaneous regression or immune-mediated destruction of primary tumor or the small size of a primary tumor may be an explanation, it is not yet fully understood why primary tumors remain undetected (2,7,8). Several studies reported that 18F-fluorodeoxyglucose (FDG) positron emission tomography/computed tomography (PET/CT) has higher sensitivity than other imaging methods for detection of the primary tumor (9,10,11). The aim of this retrospective study is to evaluate to primary tumor detection efficiency of 18F-FDG PET/CT in patients with CUP. All patients who have been referred to our department for 18F-FDG PET/CT with a diagnosis of CUP from April 2013 to March 2016 were retrospectively evaluated. Patients who had inadequate medical records or irregular clinical follow-up data and who had chemotherapy before imaging were excluded. 121 patients (79 men, 42 women, age range 30-86 years, mean 63±12 years) were analyzed finally in the study. Ninety five out of 121 patients were proved to have metastases histopathologically and 26 patients had highly suspicious metastases by conventional imaging [8 patients with multiple lung metastases detected by CT, 10 patients with multiple bone metastases detected by scintigraphy and/or magnetic resonance imaging (MRI), 5 patients with multiple liver metastases by MRI and/or US, and 3 patients with brain metastases detected by MRI]. 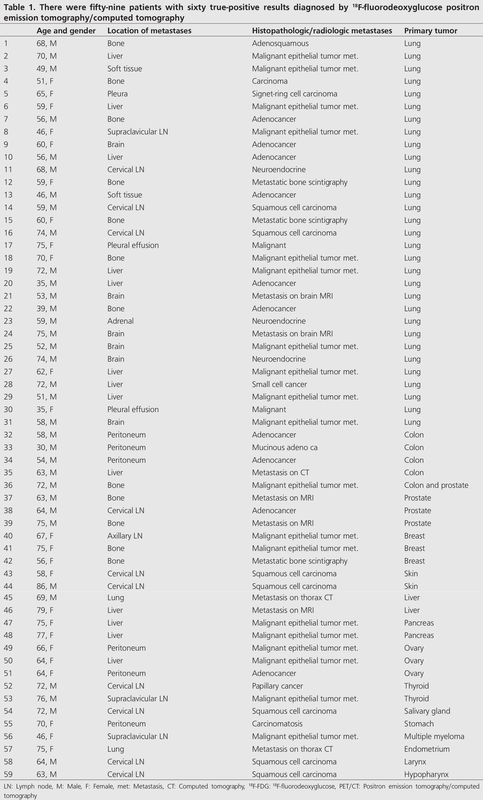 Locations of the metastatic foci that have been proven histologically were as follows; 36 in lymph nodes, (21 cervical, 6 supraclavicular, 4 axillary, 2 mediastinal, 2 inguinal, 1 retroperitoneal), 19 in liver, 13 in bone, 6 in brain, 3 in soft tissue, 1 in adrenal gland, 1 in lung, 9 patients had peritoneal implants or malignant ascites, 6 patients had malignant pleural effusion and 1 patient had malignant pericardial effusion. The study were approved by the Adnan Menderes University of Local Ethics Committee (protocol number: 2017/1043). All patients underwent 18F-FDG PET/CT imaging after 6-8 hours of fasting. Before injection of 18F-FDG, the medical history, weight and blood sugar level of the patients were recorded. All patients’ blood sugar levels were less than 180 mg/dL prior to imaging. Oral contrast was given to all patients. After intravenous administration of 270-370 MBq of 18F-FDG, patients rested in a quiet room. Imaging was performed after a resting period of 60 minutes with (Siemens Biograph mCT 20 Excel) PET/CT scanner. Images were acquired from the head to the feet. The CT transmission scan was acquired with 140 kVp and 110 mA and 3 mm slice thickness. PET scan was acquired at 2-4 min per bed position. 18F-FDG PET/CT images were evaluated both visually and semi-quantitatively by two nuclear medicine physicians. Abnormal 18F-FDG uptake (SUVmax ≥2.5) with an anatomical correlation in any tissue or organ other than the metastases sites was considered as the primary site. The final results were confirmed either histopathologically or by clinical follow up including other imaging methods. The final diagnosis was considered true-positive (TP) when 18F-FDG PET/CT detected the primary tumor and it was confirmed histopathologically and/or by clinical follow up. If it was not confirmed to be malignant histopathologically then the result was considered as false-positive (FP). If 18F-FDG PET/CT could not detect the primary tumor and it remained unknown in follow up, the result was considered true-negative (TN). When 18F-FDG PET/CT did not suggest any primary tumor but it was diagnosed with conventional work-up or in the patient’s follow-up, the result was considered as false-negative (FN). Primary tumors were correctly detected in 59 of 121 patients (49%) by 18F-FDG PET/CT whole body imaging. The primary tumor locations were as follows; lung (n=31), breast (n=3), stomach (n=1), colon (n=4), pancreas (n=2), ovary (n=3), prostate (n=4), liver (n=2), endometrium (n=1), skin (n=2), thyroid (n=2), larynx (n=1), hypopharynx (n=1), salivary gland (n=1) and bone marrow (multiple myeloma; n=1). In a patient, two primary tumors (colon and prostate) were detected by PET/CT imaging both of which were confirmed histopathologically (Figure 1). In this patient, the bone marrow biopsy revealed metastatic prostate carcinoma thus the colon carcinoma was accepted as a synchronous second primary tumor. Fifty-nine TP results were selected for statistical evaluation. The SUVmax of the hyper-metabolic lesions were between 3 to 27 (mean 11.57±6.1). TP results are reported in Table 1. The sensitivity, specificity rates and accuracy of 18F-FDG PET/CT in detection of primary tumor were identified as 84%, 78% and 82%, respectively. When 36 patients with lymph node metastases were evaluated separately, primary tumors were correctly identified in 14 out of 36 patients. In these cases, the sensitivity, specificity and accuracy were calculated as 66%, 75% and 70%, respectively. There were eleven patients in whom primary tumors were reported incorrectly by 18F-FDG PET/CT imaging. These results were accepted as false-positive (Table 2). A false-positive case is presented in Figure 2. The primary tumor could not be identified in 51 (42%) patients. Forty of these patients were TN. The remaining 11 patients, 18F-FDG PET/CT did not detect any lesion but the primary tumors were detected during clinical follow-up (mean 6.8 months, range: 2-30 months). These FN results are listed in Table 3. Additional distant metastases were detected in 45 out of 59 (76%) patients whose primary tumors were detected correctly by 18F-FDG PET/CT. In patients with only lymph node metastases, additional solid organ metastases were detected in 5 patients out of 36 (14%) with PET/CT imaging. CT and MRI have been the imaging methods of choice in clinical practice in patients with CUP. Although they detect anatomical abnormalities with pathologic contrast enhancement, small or non-enhancing lesions can be overlooked (1). 18F-FDG PET/CT is gaining acceptance as an imaging method to be used in the management of patients with CUP. Small lesions can be detected with higher sensitivity due to its high lesion-to-background contrast. Several studies reported that 18F-FDG PET/CT is more sensitive than CT and MRI in the imaging of CUP. In a study, Gutzeit et al. (12) have shown that CT alone indicated a primary tumor in only 8 of 45 patients (18%) while 18F-FDG PET/CT detected the primary site in 15 of 45 patients (33%). In another study, Roh et al. (13) have reported that the sensitivity rate of 18F-FDG PET/CT (87.5%) was significantly higher than that of CT (43.7%) for the primary tumor in patients with cervical metastases from unknown origin. In several studies, primary tumor detection rate ranged between 24.5-53% for 18F-FDG PET/CT in patients with CUP (11,14,15,16). Consistent with the literature, in this study, primary tumors were correctly detected in 59 of 121 patients (49%) by 18F-FDG PET/CT whole body imaging. The sensitivity, specificity rates and accuracy of 18F-FDG PET/CT in detection of primary tumor were identified as 84%, 78% and 82%, respectively. Han et al. (17) reported the sensitivity, specificity and accuracy of 18F-FDG PET/CT in patients with CUP as 91.5%, 85.2% and 88.3%, respectively. In another study, the sensitivity, specificity and accuracy of 18F-FDG PET/CT in detection of primary tumor were reported as 80%, 74% and 78%, respectively (18). In our study, 18F-FDG PET/CT was the first imaging method used for detecting the primary in majority of the patients. Although the role of 18F-FDG PET/CT as the first line imaging of patients with CUP is yet to be established, it has significant advantages. Whole body imaging demonstrates disease extent in addition to detection of the primary tumor, eliminates the need for further imaging and other invasive procedures. Thus, it prevents delay in starting appropriate treatment (19,20). Lung, oropharyngeal and pancreatic cancers were reported to be most common primary tumors in patients with CUP (21). In our study, lung (52%) and colon (8%) were the most common sites for primary tumors. Colorectal cancer is the third most common cancer in women and the fourth in men in our country (22). Although there were 21 patients with cervical lymph node metastases in our study, we detected 5 head and neck tumors as true-positive. The most important limitation of 18F-FDG PET/CT is that it’s not a specific tumor imaging technique. Inflammatory lesions or benign tumors with high tracer uptake are the most common causes of false-positive results. In our study, there were eleven false-positive results related to benign tumors or inflammation. In a meta-analysis, authors reported that oropharynx and the lung are the two most common locations of false-positive 18F-FDG PET/CT results (21). Inflammatory lesions, pulmonary infarction and emboli have been reported as etiologies for false-positive results in the lung (2,12). In this study, 3 out of the 11 false-positive results were detected in the lung. Pulmonary alveolar proteinosis, hamartoma and inflammation were the final diagnosis in these patients. PET/CT diagnosed a false-positive colon cancer in three patients. The final diagnoses were polyps in two patients and diverticulitis in one patient, that were confirmed histopathologically. In a study, the authors concluded that if 18F-FDG PET/CT findings are positive, a confirmatory biopsy is necessary due to false-positive results (23). In our study, 18F-FDG PET/CT could not detect the primary tumor in 42% of patients. Primary tumors were detected on follow-up in 11 out of 51 patients and were considered as FN. Small and low grade tumors with low 18F-FDG uptake may result in FN findings. Breast and oropharynx are the most common sites for FN 18F-FDG PET/CT imaging (21). In this study, a small primary breast cancer was detected by MRI and was histopathologically diagnosed as invasive ductal cancer following a FN 18F-FDG PET/CT imaging. In four patients, lung tumors with low 18F-FDG avidity caused FN results. 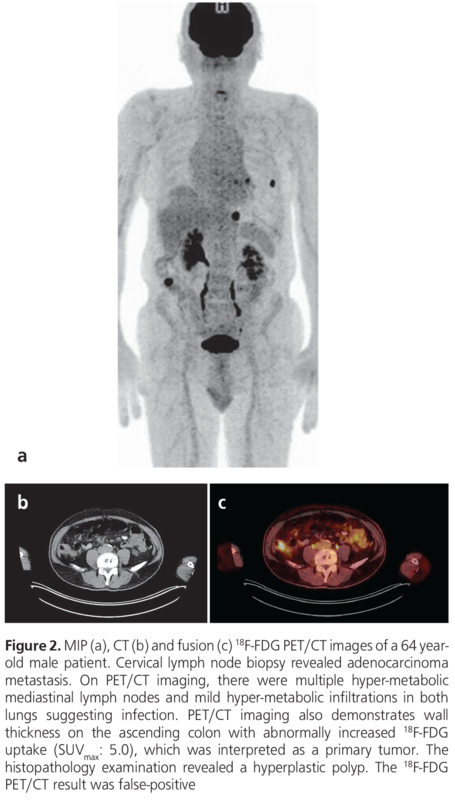 Whole body 18F-FDG PET/CT is also useful in detecting the extent of metastatic disease which may have important implications for clinical management. It is especially important in patients with initial lymph node metastases (2,24). We showed additional solid organ metastases in 5 out of 36 (14%) patients with CUP who presented with lymph node metastases on PET/CT imaging. Whole body 18F-FDG PET/CT is an effective method for detecting the primary tumors in patients with CUP. Additionally, it can also determine disease extent and contribute significantly to clinical patient management. Ethics Committee Approval: The study were approved by the Adnan Menderes University of Local Ethics Committee (protocol number: 2017/1043). Surgical and Medical Practices: A.C., S.G., Y.Y., Concept: A.C., Design: A.C., S.G., Y.Y., Data Collection or Processing: A.C., S.G., Y.Y., Analysis or Interpretation: A.C., Y.Y., Literature Search: A.C., Writing: A.C., Y.Y. Pavlidis N, Fizazi K. Carcinoma of unknown primary (CUP). Crit Rev Oncol Hematol 2009;69:271-278. Kwee TC, Basu S, Cheng G, Alavi A. FDG PET/CT in carcinoma of unknown primary. Eur J Nucl Med Mol Imaging 2010;37:635-644. Pavlidis N, Briasoulis E, Hainsworth J, Greco FA. Diagnostic and therapeutic management of cancer of unknown primary. Eur J Cancer 2003;39:1990-2005. Chorost MI, Lee MC, Yeoh CB, Molina M, Ghosh BC. Unknown primary. J Surg Oncol 2004;15;87:191-203. Haas I, Hoffmann TK, Engers R, Ganzer U. Diagnostic strategies in cervical carcinoma of an unknown primary (CUP). Eur Arch Otorhinolaryngol 2002;259:325-333. Raber MN, Faintuch J, Abbruzzese JL, Sumrall C, Frost P. Continuous infusion 5-fluorouracil, etoposide and cisdiamminedichloroplatinum in patients with metastatic carcinoma of unknown primary origin. Ann Oncol 1991;2:519-520. Pentheroudakis G, Briasoulis E, Pavlidis N. Cancer of unknown primary site: missing primary or missing biology? Oncologist 2007;12:418-425.
van de Wouw AJ, Jansen RL, Speel EJ, Hillen HF. The unknown biology of the unknown primary tumour: a literature review. Ann Oncol 2003;14:191-196. Sève P, Billotey C, Broussolle C, Dumontet C, Mackey JR. The role of 2-deoxy-2-[F-18]fluoro-D-glucose positron emission tomography in disseminated carcinoma of unknown primary site. Cancer 2007;109:292-299. Rusthoven KE, Koshy M, Paulino AC. The role of fluorodeoxyglucose positron emission tomography in cervical lymph node metastases from an unknown primary tumor. Cancer 2004;101:2641-2649. Delgado-Bolton RC, Fernández-Pérez C, González-Maté A, Carreras JL. Meta analysis of the performance of 18F-FDG PET in primary tumor detection in unknown primary tumors. J Nucl Med 2003;44:1301-1314. Gutzeit A, Antoch G, Kühl H, Egelhof T, Fischer M, Hauth E, Goehde S, Bockisch A, Debatin J, Freudenberg L. Unknown primary tumors: detection with dual-modality PET/CT--initial experience. Radiology 2005;234:227-234. Roh JL, Kim JS, Lee JH, Cho KJ, Choi SH, Nam SY, Kim SY. Utility of combined (18)F-fluorodeoxyglucose-positron emission tomography and computed tomography in patients with cervical metastases from unknown primary tumors. Oral Oncol 2009;45:218-224. Lonneux M, Reffad A. Metastases from Unknown Primary Tumor. PET-FDG as Initial Diagnostic Procedure? Clin Positron Imaging. 2000;3:137-141. Bohuslavizki KH, Klutmann S, Kröger S, Sonnemann U, Buchert R, Werner JA, Mester J, Clausen M. FDG PET detection of unknown primary tumors. J Nucl Med 2000;41:816-822. Han A, Xue J, Hu M, Zheng J, Wang X. Clinical value of 18F-FDG PET-CT in detecting primary tumor for patients with carcinoma of unknown primary. Cancer Epidemiol 2012;36:470-475. Riaz S, Nawaz MK, Faruqui ZS, Saeed Kazmi SA, Loya A, Bashir H. Diagnostic Accuracy of 18F-Fluorodeoxyglucose Positron Emission Tomography-Computed Tomography in the Evaluation of Carcinoma of Unknown Primary. Mol Imaging Radionucl Ther 2016;25:11-18. Pelosi E, Pennone M, Deandreis D, Douroukas A, Mancini M, Bisi G. Role of whole body positron emission tomography/computed tomography scan with 18F-fluorodeoxyglucose in patients with biopsy proven tumor metastases from unknown primary site. Q J Nucl Med Mol Imaging 2006;50:15-22. Wang G, Wu Y, Zhang W, Li J, Wu P, Xie C. Clinical value of whole-body F-18 fluorodeoxyglucose positron emission tomography/computed tomography in patients with carcinoma of unknown primary. J Med Imaging Radiat Oncol 2013;57:65-71. Kwee TC, Kwee RM. Combined FDG-PET/CT for the detection of unknown primary tumors: systematic review and meta-analysis. Eur Radiol 2009;19:731-744. Aykan NF, Yalçın S, Turhal NS, Özdoğan M, Demir G, Özkan M, Yaren A, Camcı C, Akbulut H, Artaç M, Meydan N, Uygun K, Işıkdoğan A, Ünsal D, Özyılkan Ö, Arıcan A, Seyrek E, Tekin SB, Manavoğlu O, Özet A, Elkıran T, Dişçi R. Epidemiology of colorectal cancer in Turkey: A cross-sectional disease registry study (A Turkish Oncology Group trial). Turk J Gastroenterol 2015;26:145-153. Fletcher JW, Djulbegovic B, Soares HP, Siegel BA, Lowe VJ, Lyman GH, Coleman RE, Wahl R, Paschold JC, Avril N, Einhorn LH, Suh WW, Samson D, Delbeke D, Gorman M, Shields AF. Recommendations on the use of 18F-FDG PET in oncology. J Nucl Med 2008;49:480-508. Basu S, Alavi A. FDG-PET in the clinical management of carcinoma of unknown primary with metastatic cervical lymphadenopathy: shifting gears from detecting the primary to planning therapeutic strategies. Eur J Nucl Med Mol Imaging 2007;34:427-428.